I'm NOT her. I never will be. Part of me would love to attain such status. The other part says not in this lifetime. It truly is chaotic and overwhelming to be everything that the original feminists appeared to want for us. Now I'm all for equality for women and people in general, however, I am now noticing a trend that I don't necessarily like. Sure, women can vote and voice their opinions, all good things. Yet now with us "allowed" to work, our roles as SAHM's (Stay At Home Moms) is looked down upon. (SAHD's, I feel bad for how your looked at, I've heard the comments) If you are a mom that is admitting she wants to work and NOT stay at home with her children, well down with you too! A woman now has a "New Role". This means that she must be like "Missy Miss" above, raise a family, take care of the home and now hold down a job. The more time consuming job the better. If she isn't taking in almost as much as her husband than she just isn't contributing. But don't be a total bread winner because then you are emasculating your significant other. (His opinion on this doesn't matter so shush) Let's not forget that if there are children involved the simple solution is to stick them in a daycare and let someone else experience each and every first. Nope, I am not liking this 1)because I believe the job of a mother is the hardest job anyone could possibly do (I consider my work days a vacation). 2)even if I wanted to be I don't do "Domestic Goddess" well. 3)I don't want to work full time and not have anytime to myself or watch my children grow. 4)While I enjoy a little self abuse (I have four children and wanted four sets of twins remember), I don't enjoy self abuse that includes sleep deprivation. (if you don't believe me read my last post point #6 I believe) So through all that I have found I am neither of the extremes. I am not June Cleaver, and I am not Super Mom. I'm somewhere in the middle. I want the vision that the feminists had, but I want the choice to decide what part of the vision I want instead of being judged by who else. Other women. It is sad really. Why on earth do we do this to each other? What is it to another woman if I have children and work? Or if I'm a "Kept" woman (My SO works and I stay at home to raise the kids)? What is it to another woman if I'm at home and bake pies all day or teach my children to be little geniuses? (BTW I am by no means patient enough to teach my children, that is why I don't home school. Bowing down to homeschooling mom's now.) What is it to another woman if I chose to work a full time job while my husband becomes a SAHD? (I don't understand why this is done, but it's not my place to judge what works for another family. On that note I think my husband would be a phenomenal SAHD) What is it to another woman if I nurse or use formula? The list literally goes on. Prior to my fourth child I had my own perceptions of motherhood. I did it all (okay I still didn't live up to June Cleaver), but I did take care of kids and work. My job is being home with my kids during the week and working awake overnights at my job on the weekends. My husband and I sacrifice seeing each other so we can raise our children. This is not by choice. Unfortunately, the direction things are going, the life of a one income family is just a pipe dream. So I was truly a Supermom. 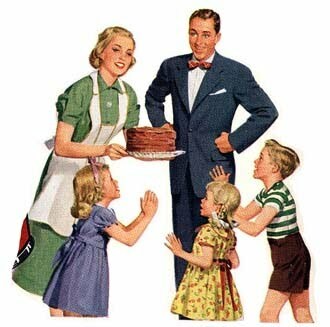 I had it all together and my house and children were pristine. I was also able to train for 5k's, 10k's and half marathons. Then comes L and it all blew up in my face. Supermom became Super Frazzled. I cannot keep up and I'm on maternity leave. I don't have a job to go to, I have all this time during the day. I should be teaching my kids and doing crafts. I should be June Cleaver. My laundry shouldn't be half folded in the living room. Okay, there are a lot of should's and should not's here. (Stopping long list here to spare you the boredom). This is not the person Mom I thought I'd end up being. The one that looks like she needs about 10 cups of caffeine and an extended vacation alone on a deserted island. Yet, I get the "poor you" looks daily. (could be why I now try living like a recluse when the family allows it). This is a good place to be at though, it's a humbling place. 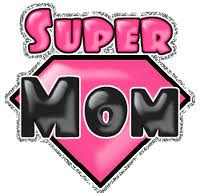 My Supermom snobbishness has been put in it's place. It took a fourth child and a high energy daughter to break me, but I'm here, and I'm sorry for my judgmental ways. Here's a cheers to my hero!! Being a stay at home parent is probably the most difficult job out there. I give props to those can do it, in fact if we could afford to live off of one income I would do it. A subject close to my heart.Until I moved to America I worked full time and abdicated responsibility for my kids on a daily basis. I was expected to justify this to accusing stay at home Mom's looks. I loved my job but felt I couldn't do a good job of being a Mom or a professional. The sacrafice I made was me! Now I am a stay at home mom my kids go to school! I am bored witless and miss the company and stimulus of work. I love being the one at the bus stop and for the first time - eating as a family every night. I am patronised by working Mothers in the UK. My leaving gifts from work were cupcake related! Where I live in the USA it seems to be a status symbol to stay at home and bake cupcakes. I cant compete!! When feminists won all those 'rights' for women they really should have taken biology into consideration. We cant do it all but now it is our 'right' and we are expected to be grateful! I feel a blog coming on!!! You are clearly doing an amazing job! Great thought provoking blog today! I love this blog post! Why, as women, do we do this to one another!?! It is simply beyond me. Rather than supporting each other for whatever choices we make, SAHM, work, breast feed, bottle feed, etc...we feel the need to pull each other down. Ugh! Thank you for writing this post, I loved it!